Christmas cookies or Christmas biscuits are traditionally sugar cookies or biscuits (though other flavours may be used based on family traditions and individual preferences) cut into various shapes related to Christmas. Modern Canadian and American style Christmas cookies. 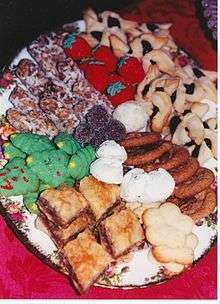 Modern Christmas cookies can trace their history to recipes from Medieval Europe biscuits, when many modern ingredients such as cinnamon, ginger, black pepper, almonds and dried fruit were introduced into the west. By the 16th century Christmas biscuits had become popular across Europe, with lebkuchen being favoured in Germany and pepparkakor in Sweden, while in Norway krumkake were popular. The earliest examples of Christmas cookies in the United States were brought by the Dutch in the early 17th century. Due to a wide range of cheap imported products from Germany between 1871 and 1906 following a change to importation laws, cookie cutters became available in American markets. These imported cookies cutters often depicted highly stylised images with subjects designed to hang on Christmas trees. Due to the availability of these utensils, recipes began to appear in cookbooks designed to use them. In the early 20th century, U.S, merchants were also importing decorated lebkuchen cookies from Germany to be used as presents. In Canada and the United States, since the 1930s, children have left cookies and milk on a table for Santa Claus on Christmas Eve, though many people simply consume the cookies themselves. The cookies are often cut into such shapes as those of candy canes, reindeer, and holly leaves. Gingerbread has existed in some form since sugars and spices were brought back to Europe, from soldiers in the Crusades. However, it wasn't until Queen Victoria and Prince Albert included it with a variety of other German Christmas traditions that the gingerbread cookies became primarily associated with Christmas. Gingerbread cookies are also traditional in Alsace. Bredala are Christmas cookies in Alsatian cuisine of France. A traditional cookie which dates from the Middle ages in Norway, Fattigmann cookies are deep fried in unsalted fat. Krumkake are centuries-old cookies from Norway. They were originally baked over open fires using decorative irons; however modern cooks use electric or stovetop irons to bake these wafer-thin biscuits. Krumkake are wrapped in a cone shape, and are named for the crumbs left in your hand after taking the first bite. Pepparkakor are crisp, thin gingersnap biscuits from Sweden, traditionally cut out in flower and heart shapes. 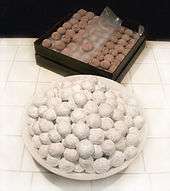 Pfeffernüsse originate in Scandinavia and date from medieval times when spices were used exclusively in holiday baking. Repostería is a Mexican type of shortbread-like cookie that's lightly baked and dipped into a cinnamon sugar blend until the cinnamon sugar surrounds the cookie. These are often served with coffee or hot spiced Mexican chocolate. Sandbakelse are sugar cookies from the nineteenth century Norway. The dough is pressed into tins, and then baked in an oven. Springerle have been traditional Christmas cookies in south Germany (Bavaria and Baden-Württemberg) and Austria for centuries. They are anise-flavored cookies made from an egg-flour-sugar dough. They are usually made in simple shapes, such as rectangles or circles. After shaping, they usually have a picture or design pressed into the soft dough with specially carved rolling pins or presses. After they are baked, the designs are sometimes colored if the intention is to use the cookies as decorations. 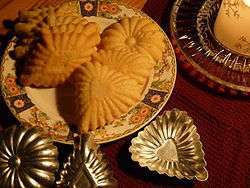 Also called Amish sugar cookies or Nazareth sugar cookies, the modern sugar cookie was created by the Moravians, who settled in the Nazareth area from Germany during the mid-18th century. Pennsylvania adopted the Nazareth sugar cookie as the official state cookie in 2001. 1 2 "Food Timeline: Christmas foods". FoodTimeline.org. Retrieved 2009-12-13. ↑ "Christmas Cookie Tradition". NewEnglandRecipes.org. Retrieved 2012-12-07. ↑ Carey, Mac. "The Tradition of Gingerbread". MyMerryChristmas.com. Retrieved 2009-12-13. 1 2 3 4 Dern, Judith H. "Scandinavian Christmas Cookies". All Recipes.com. Retrieved 2009-12-13. ↑ Clamp, Esther. "Reposteria (The Powdery Yummy Cookies) recipe - from the My Family's Best! A Collection of Recipes Family Cookbook". FamilyCookbookProject.com. Retrieved 2010-10-28. 1 2 "History of Cookies". What's Cooking America. Retrieved 2009-12-13. 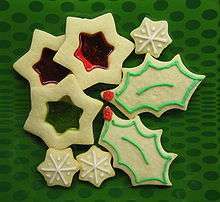 Wikimedia Commons has media related to Christmas cookies.